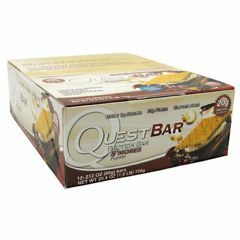 AllegroMedical.com presents The Quest Nutrition Quest Protein Bar - S'mores Protein Bar Gluten Free. Only 1g Sugar. 13g Fiber. Gluten Free. 20g Protein per serving. No added sugar. Stays fresh longer. Only 4g net carbs. They said that this protein bar couldn't be made, but we finally did it. It's delicious food packed with protein that makes no compromises. Just read our ingredients and you'll see.